"H. C. Baxter & Bros. Research Team "
An image scanned from a black and white photograph of a research team for the Baxter and Brothers Canning Company. Text on the back of the photograph indicates that these individuals planned, developed, and directed the first quick frozen french fried potato production at Corinna, Maine. 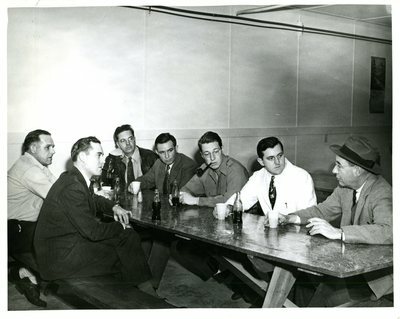 Left to right: Frank Fisher, Plant Manager; Cobbson, representative of Bird's Eye for whom the frozen french fries were produced; O. P. Pierson, engineer who assisted in working out the processing; Bruce H. M. White, Vice President of Snow Flake Canning Company, and controller of H. C. Baxter and Brothers which built the plant; J. L. Baxter, Jr., Vice President and assistant Treasurer of Snow Flake Canning Company, and its Production Manager; Francis Saunders, quality control manager and director of new product research who designed the process, and John L. Baxter, Sr., President of Snow Flake, coordinator of H.C. Baxter & Bro., and immediate past President of the National Frozen Foods Association. Saunders was plant manager at the time the photograph was taken. The text also refers to "the late Frank Fisher," so it must have been taken following his death, but the photograph is not dated.